This is a tough one for anyone to believe but it’s also proving quite difficult for scientists and archaeologists to effectively explain away. 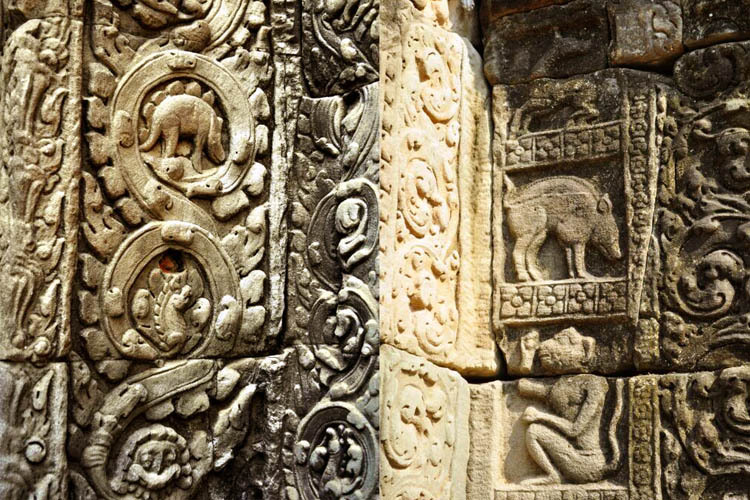 Some years ago an eagle-eyed visitor to the Ta Prohm temple in Cambodia noticed what looks like a carving of a stegosaurus – or at least of a dinosaur similar to the stegosaurus. Photographs were taken and posted onto the internet. Creationist groups quickly started to refer to the Cambodian stegosaurus as proof that mankind once lived alongside the dinosaurs. How else would the ancient temple builders know what to carve? The Cambodian stegosaurus has been featured in a myriad of TV and YouTube programmes about subjects ranging from aliens to Atlantis. 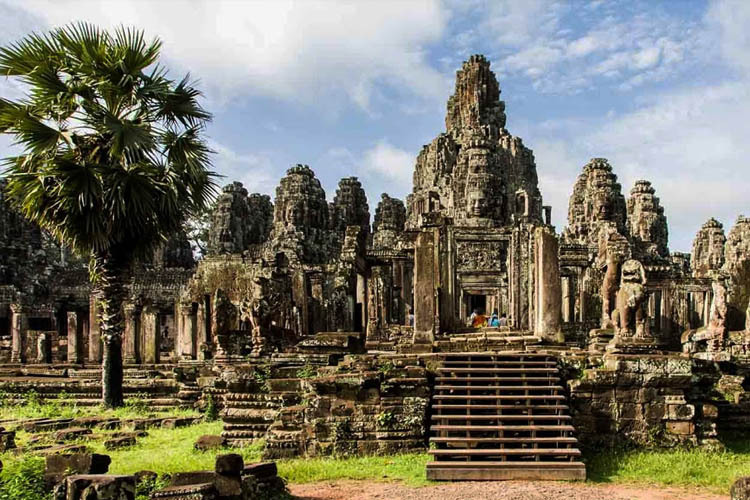 Ta Prohm is the name of a temple at Angkor, Cambodia. Originally called Rajavihara, It was built in the late 1100’s and early 1400’s as a Buddhist monastery. It certainly is fascinating and needs a closer look at the arguments of the believers and the sceptics. Scientific representation of a stegosaurus. 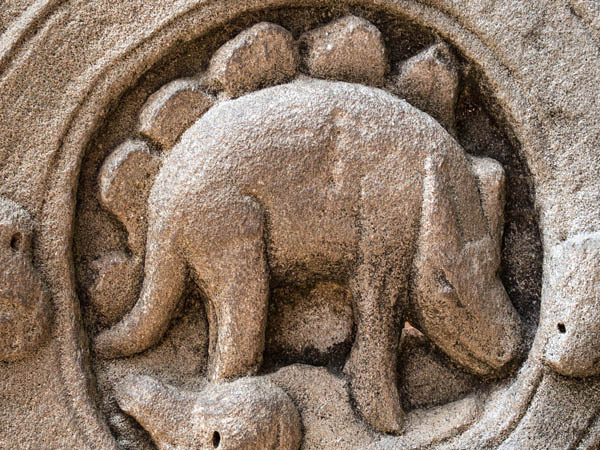 Stegosaurus carving at the Temple of Ta Prohm. It might look a bit like a stegosaurus but it’s not a stegosaurus. According to the sceptics, the carving has serious anatomical errors when compared to an actual scientific reconstruction of a Stegosaurus. The head is too broad and seems to have large ears or horns. The plates along the back of the carving are more like leaves. Careful analysis of local animals suggests that the sculpture is most likely a boar or waterbuck in front of a leafy background. Well … it might be a carving of a stegosaurus, but it’s new-ish. What’s quite worrying is that after a while the sceptics then say: “Well … even if it is a stegosaurus then it was carved recently as a hoax.” There are theories that the carving was made when the film ‘Tomb Raider’ was being shot on location at Ta Prohm probably out of boredom or as a film crew joke. They then go on to say that anyone could have carved it. And … they may have a point. A key argument for the “it’s new” proposal is the fact that the stegosaurus carving seems somewhat lighter than those around it. OK … it is a representation of a stegosaurus but was based on fossils. 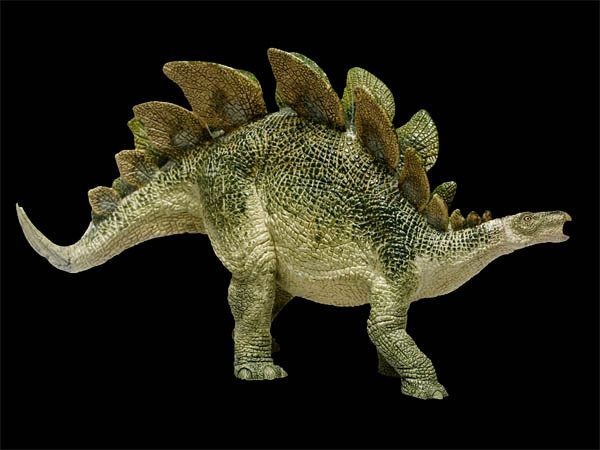 Finally, the sceptics point out that even if it is a carving of a Stegosaurus then it was probably based on a fossil skeleton found locally which would explain why the head is too large and the hind legs aren’t long enough. The “stegosaurus carving” is located on a central stele that features a date. Translated into the modern calendar it reads as 1186 AD. Other carvings on the column clearly show the ancient artist’s expertise at reproducing known animals. It’s important to point out that none of the carvings are precisely correct and the ancient artists exaggerated elements to emphasise the importance of the creatures including lions, elephants and horses. With regard to the missing spikes, they would not be clearly visible based on the angle of the carving. The hind legs are more of a problem but it could be that the artist simply shortened them so that the carving would fit into the space available. There is no evidence that the carving is recent. According to the researchers associated with the ruins, there is no evidence of over-carving or recent replacement stonework. Historians, in general, agree with this point. The carving appears as genuine as the other carvings on the same pillars that show lizards, monkeys and swans to name but a few. There’s a good reason the stone is lighter coloured! The guides and the researchers at Ta Promh are happy to explain that visitors to the temple have been making plaster casts (moulds) of the stegosaurus carving and that this process has lightened the stone. Early photos of the stele clearly show that it was once the same shade as those around it. Really based on a fossil? No stegosaurus fossils have been found in the region. The closest discovered were in China a fair old distance away. Of course, this doesn’t mean that the ancients didn’t find one just that it’s quite unlikely. Nobody has ever owned up to carving it – even anonymously. As the heading says! If the carving was a hoax it is almost inconceivable that the hoaxers would have made at least some attempt to let people know how he or she fooled the world. Stegosaurus carving alongside other reliefs depicting recognisable animals from the region. It would be kind of crazy and wonderful to think that a land dinosaur survived until recently but the scientific evidence suggests otherwise. Then again, science has been wrong before. Still, before you book your ticket to Jurassic Park Cambodia please keep in mind that the carving is at least 800 years old and if there was a real live stegosaurus then it’s probably long gone by now.